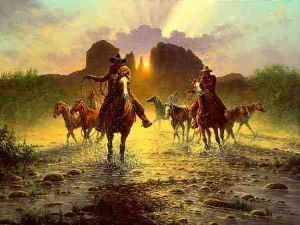 Inspired by a visit to the Red Rock Country near Sedona, Arizona, I sought to capture the action of the Old West. As the morning sun peeks from behind Cathedral Rock, the chase is on. Wild mustangs freely roam the desert while these anxious riders with ropes in hand have other ideas. With hooves pounding and water splashing, their eyes are fixed on the horses they have set out to catch and tame. Will their ropes hit their mark or will the horses escape to their desert freedom on this day of "Rustling Mustangs."